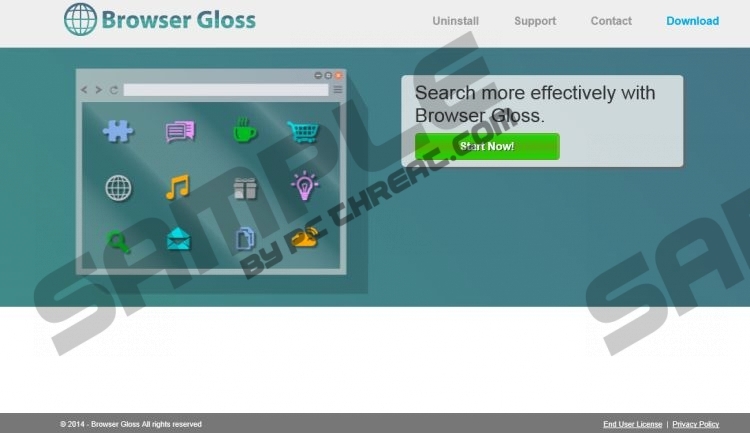 Browser Gloss is an application that should be removed at the point of its discovery on your operating system. It is nothing more than your average adware application, which causes annoyance, frustration, and could possibly expose your operating system to harmful web content. Quite a few users might be tricked into installing this dubious third-party application due to the misleading marketing strategies. The vendors of Browser Gloss state that by using their application you will be able to save money and time while shopping online, because Browser Gloss will provide you with best discount deals, coupons, and other various offers. It sure sounds tempting, especially if you are a frequent online shopper. Unfortunately, these statements are all false, as all that Browser Gloss is capable of is disturbing you and causing frustration to no end. It is an utterly useless application that should be removed ASAP. Do not hesitate and use the provided removal guide below. To make matters worse, it was discovered that Browser Gloss could turn out to be quite malicious. The provided adverts or pop-ups by this adware program could contain redirect links within them. Thus, exposure of your system to dubious web content is more than likely. By running Browser Gloss on your computer you put your operating system at constant risk of infection. Your system could be invaded by Trojans, rootkits, or keyloggers. All of this could have devastating consequences. Do not risk as the outcomes could be extreme; remove Browser Gloss immediately. The removal of Browser Gloss is essential, if you wish to maintain your system clean, secure, and fully functioning. A seemingly harmless adware application could cause major virtual threats and have devastating outcomes. Follow the provided removal guide below. If you do not feel comfortable performing manual removal, we strongly recommend using a reliable malware removal tool in order to delete Browser Gloss entirely. Confirm that you want to remove Browser Gloss. Select Browser Gloss and click Remove. Quick & tested solution for Browser Gloss removal.